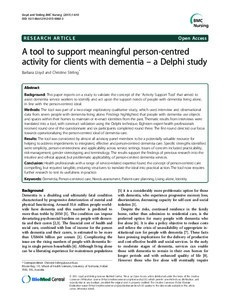 Background: This paper reports on a study to validate the concept of the ‘Activity Support Tool’ that aimed to assist dementia service workers to identify and act upon the support needs of people with dementia living alone,in line with the person-centred ideal. Methods: The tool was part of a two-stage exploratory qualitative study, which used interview and observational data from seven people with dementia living alone. Findings highlighted that people with dementia use objects and spaces within their homes to maintain or re-enact identities from the past. Thematic results from interviews were translated into a tool, with construct validation using the Delphi technique. Eighteen expert health professionals received round one of the questionnaire and six participants completed round three. The first round directed our focus towards operationalizing the person-centred ideal of dementia care. Results: The tool was considered by almost all advisory panel members to be a potentially valuable resource for helping to address impediments to integrated, effective and person-centred dementia care. Specific strengths identified were simplicity, person-centeredness and applicability across service settings. Issues of concern included practicability, risk management, gender stereotyping and terminology. The results support the findings of previous research into the intuitive and ethical appeal, but problematic applicability, of person-centred dementia services. Conclusion: Health professionals with a range of service-related expertise found the concept of person-centred care compelling, but required tangible, enduring structures to translate the ideal into practical action. The tool now requires further research to test its usefulness in practice.